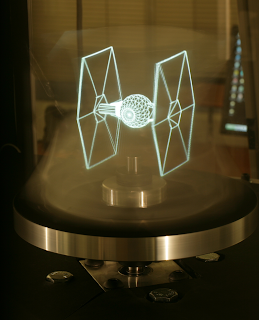 ICT Graphics Lab at USC has announced the creation of a low-cost volumetric 3-D display. Ex-squeeze me I hear ou say! Essentially they're able to creat 3D static images similar to that seen in Star Wars (R2D2's message to Leia, the schematics of the Death Star). It all works using rotating mirrors, DLP Projections, and some top end super geek maths that calculates "the correct axial perspective needed for a 360-degree image construct by linear perspective to an observer's positioning. I said it was super geek maths! Various companies have been trying to create a viable 3-D technology for years, but it has proved to be a constant difficulty. The main road blocks have been: small viewing areas and high costs. With the USC technology renders individual projections at different heights on the rotating mirror and traces each projected beam back to the display area to find the correct position of the viewer. This allows simultaneous viewing from multiple angles/distances. The system also updates itself in real time (at 200Hz).